I’m a big believer in this simple statement. I’ve learned a great deal from others and I’m always happy to share whatever I can. If you’ve ever contacted me to ask about my laser cutter, tips on opening an Etsy shop, or are curious about needle felting, you know this to be true. In the coming weeks, I have several unique opportunities to share my skills and experience with you! I’m teaching two needle felting classes this summer at Greenville Center for Creative Arts. Each session is suitable for any experience level (ages 8+). The first class (June 9th) will focus on 3D needle felting, and the second class (June 30th) will focus on 2D felting. All materials are provided. Space is limited and registration opens Friday May 5th. 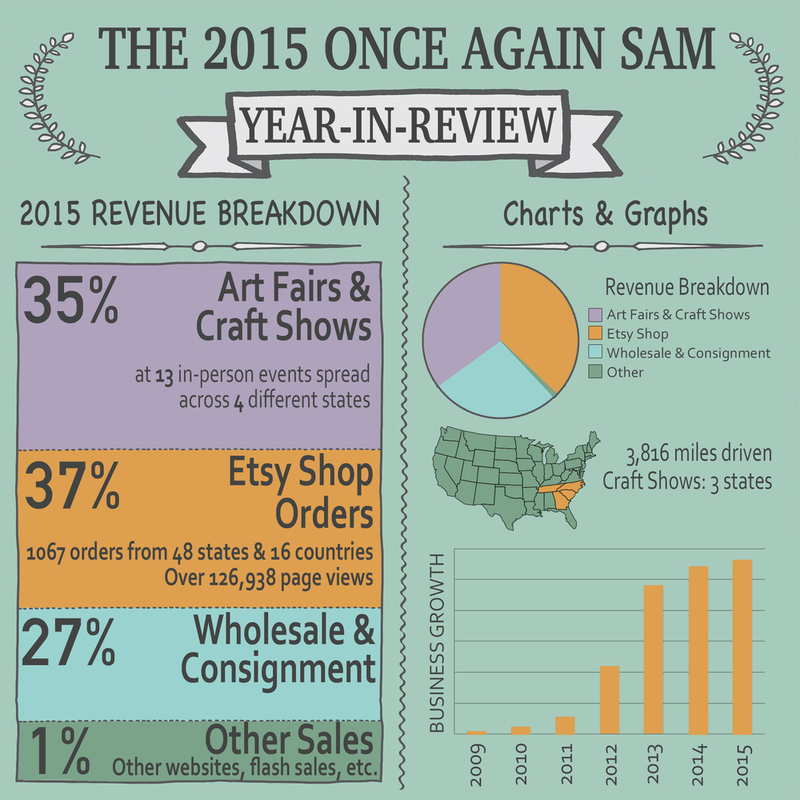 Are you an artist, small business owner, or just curious about the maker life? I highly recommend checking out The State of Making, which is a yearly conference made possible by Academy of Handmade. I’m one of the speakers on Day 1 (Thursday, May 3rd) and I’ll be talking shop and sharing what I’ve learned about the Etsy economy, diversifying your income streams, and keeping your chin up when you’re having a down year. Registration is FREE! I’m starting to pack my bags (which are mostly full of art supplies) in preparation for my upcoming South Carolina state park residency. This amazing opportunity is giving me the chance to live in a beautiful state park for a week and create a body of work inspired by my surroundings. I’ll be sharing photos and going live on Instagram and Facebook daily, as well as posting a video journal (WIFI permitting) on YouTube so be sure to subscribe to my channel so you don’t miss an episode. You’ll get up close and personal as I explore the park, create art in real time, and you’ll see the ups and downs of my creative process. The work created during the residency will be exhibited in mid June at Art & Light Gallery in Greenville, SC. I’m an American maker, a creative entrepreneur, and as of a few months ago, an Etsy Manufacturer. I’m thrilled to be a part of this marketplace for many reasons. First and foremost, I want to be involved in the vibrant maker community on a local, national, and international level, and Etsy connects us like no other. I’ve been offering laser cutting services for years now, so this new extension of Etsy is a wonderful (and much needed) way to simplify the process of matching up those who need help with those who are able to offer it. I have invested in equipment for my own business Once Again Sam, and I have skills that are beneficial to others, so Etsy Manufacturing is the perfect fit. Over the years, various businesses have found me and hired out prototypes, production of parts and pieces for their own designs, and in some cases, I have made their entire product from start to finish based on their sketches. There are many many ways these partnerships work, and I think the hardest part of the whole process is finding each other to begin with. Not anymore! Manufacturing can sometimes be a dirty word in the world of handmade. Negative images come to mind, (shady business practices, unhealthy work conditions in factories, the death of old fashioned craftsmanship, etc. ), but it doesn’t have to be that way. There are responsible ways to grow your business by increasing production, or developing your inventions, or even just expanding your product offerings, and Etsy Manufacturing is a fantastic new resource. You can search for assistance by location or by the type of production needed. Some of these Etsy Manufacturers are also Etsy sellers, just like me, and some are small businesses that have been in the manufacturing business for decades. Whatever it is you need, I’m certain you can find someone on Etsy Manufacturing who can make it for you. 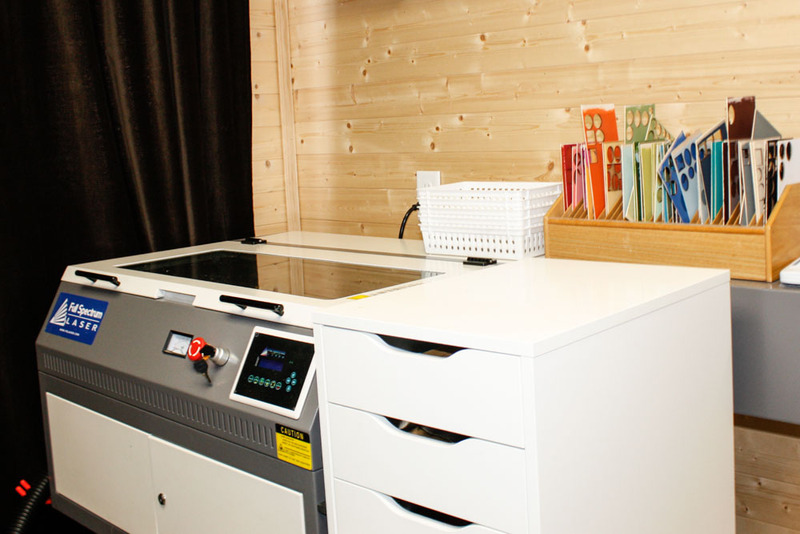 Here's what I can do: I have two laser cutters in my studio (a 40 watt and a 90 watt Full Spectrum laser cutter). With these machines, I’m am able to make precise cutouts & engravings on wood, acrylic, paper, cardboard, and leather material (just to name a few). I can help with preliminary design, or jump right into production mode if you’re ready to get started. My minimums are approachable, my prices are reasonable, and my turnaround times are speedy (typically only 1 week once material is acquired). I was thrilled to have Etsy Manufacturing sponsor a professional photography session in my studio recently with the talented Angela Cox of Angela Cox Photography. The photos she took help make my Etsy Manufacturing profile more personal, which is exactly what I wanted. When you work with Once Again Sam, you're working directly with me on a personal level, even if we never meet in person. My work is a huge part of my life, and my home is where I work. The spaces in which I create are linked to my ability to get work done, be inspired to try new things, and ultimately make a living. Working from home is ideal for me, because I can bounce around from making leather earrings, to needle felting, to laser cutting wooden pendants, to photographing new products, all without having to go anywhere. A lot can be accomplished in just one day! Today, I’m inviting you on a virtual tour of my many workspaces. 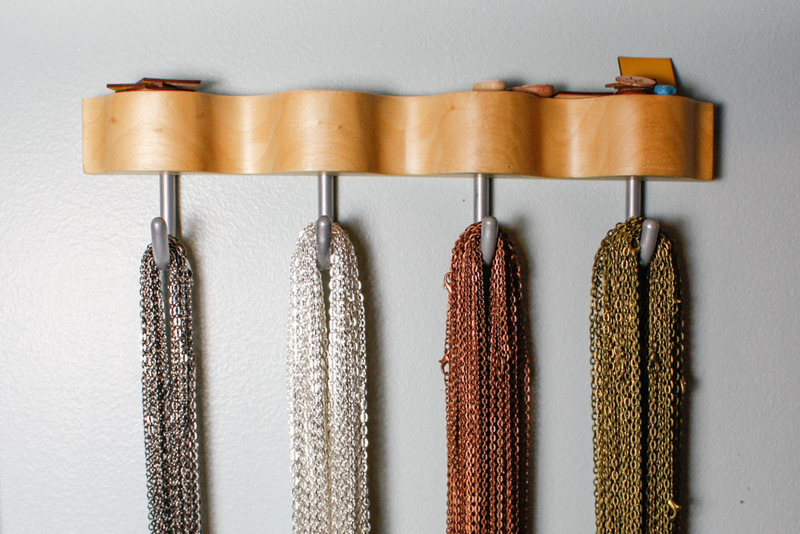 Each room is home to a different part of my process, and is the birthplace of a variety of handmade items. When you make a living making things, it can change your whole lifestyle, and your home ends up becoming more than just a place to live. Come on in, welcome to my home! 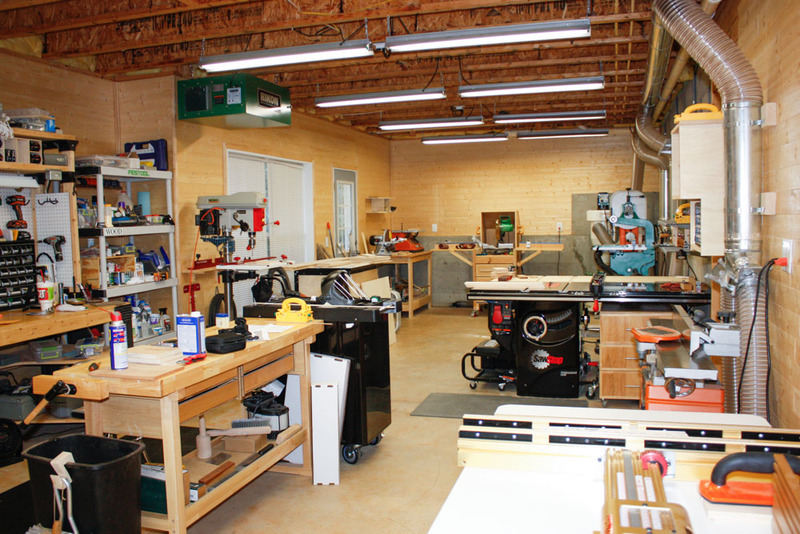 The Workshop: this is the first stop on the tour because it’s where my husband / operations manager and I have spent the most time renovating and improving lately (lighting, ductwork, wood paneling, etc.). The unfinished basement is about 900 square feet and is where a lot of production work occurs. 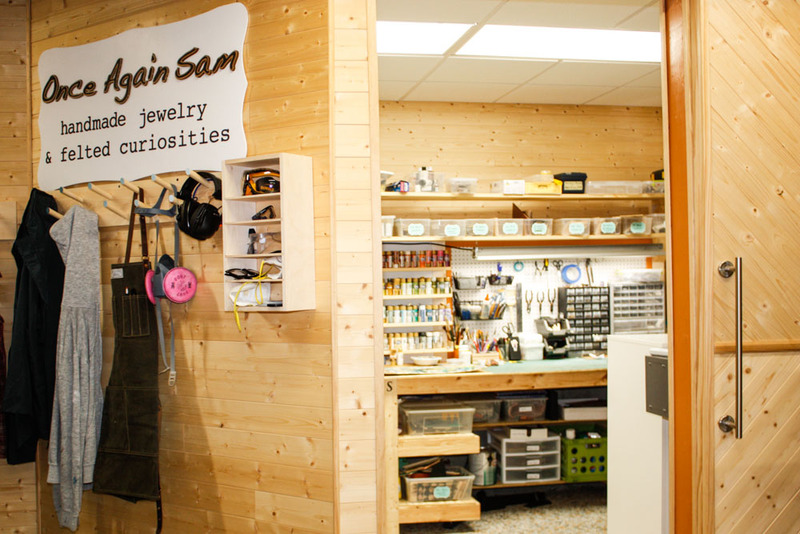 All the things that make big messes (like the lathe, sanders, saws, laser cutter, etc.) live down here. The Laser Room: In an 8x10 side room, a room that was once used as a children’s play area when we hosted a Bible study / small group a few years ago, is now the the “laser room”. I recently upgraded my 40 watt hobby laser cutter to a humongous and awesomely powerful 90 watt pro model. It’s pretty friggin’ cool! We could barely move this new machine into the house, it cost as much as a used car, and requires serious ventilation, but it was well worth it. My jewelry designs (done in Illustrator or AutoCad) are intricate, but the laser can handle it. I could never dream of doing these cuts successfully by hand, so by adding this high tech tool, I’m able to remake my designs over and over, which allows me to do large orders and keep my prices reasonable. Having a machine like this changed my whole business model several years ago when I took the plunge and bought the original laser. In this room, I also keep some leather, wood, and tons of supplies. We’ve got a small tabletop CNC router on order so that will be a welcome addition very soon. * Favorite things about this space: the workbench with “paint store” that my handy husband built for me, and my way-cool splatter paint carpet that’s fun and light, but hides everything (because let’s face it, it’s not clean, and some of those paint splatters are actually paint splatters). The Studio: From the basement workshop, walk up two flights of stairs and you’ll find my studio. This is the room where final assembly, finishing touches, photography, and packing orders occurs. All of the hand-cut leather jewelry is made here, since I still have have a number of designs that use basic hand tools rather than high tech machines. In the closet, there’s shipping supplies and about a dozen articles of clothing. Not my clothes. Clothes I got at thrift stores and intend to chop to pieces and turn into jewelry. 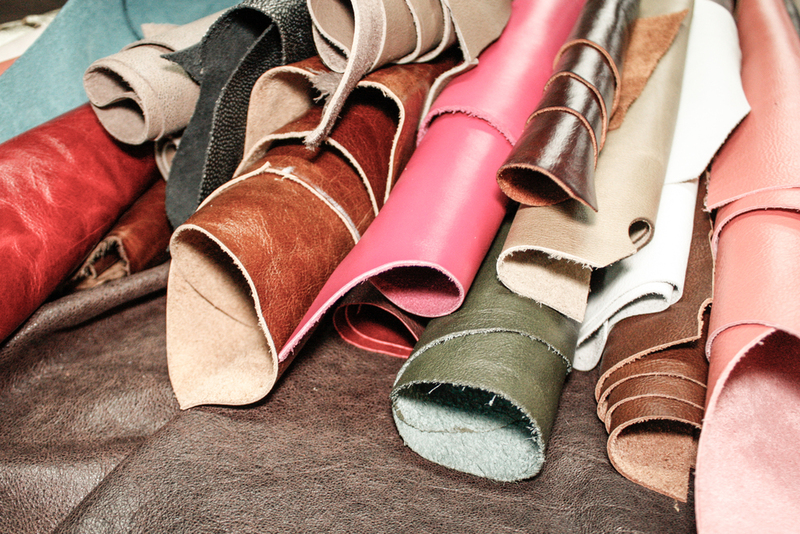 I love to repurpose leather and will buy just about anything, as long as the color is right. * Favorite things about this space: My “leather drawers” ;-) The leather scraps in these drawers are organized by color, and I get inspired just by looking at all the bits and pieces and all the possibilities they bring. The Office: Go back down one flight of stairs, and you’re in the office. It’s funny, the workshop, studio, and office are all in the same exact corner of the house, so the views are identical, just at different levels. The office is shared with my husband who works from home, and is where I do all of my correspondence, Etsy shop maintenance, photo & video editing, blogging, and accounting. Since I don’t have a physical brick & mortar store, and in-person craft shows are only seasonal, I end up doing the majority of my business from this spot in the house. * Favorite things about this space: being near my husband. We “bother” each other a lot, but it’s actually a huge blessing. There was a time back when we lived in the DC metro area when we only saw each other about 2-3 hours a day during the week. It sucked. We have a completely different lifestyle now and I wouldn’t trade it for anything. Also, his title of “Operations Manager” is 100% accurate - he keeps the biz up and running, so it’s nice having him nearby. The Couch: Not kidding! I spend several hours a day needle felting on the couch with some sort of nature documentary, depressing indie film, or audio book going in the background. The living room may pass for fairly normal at first glance, but if you look closer (like in the bins under the couch, the basket under the end table, in that dark wicker hamper sitting discreetly in the corner), you’ll notice there’s a whole flocks’ worth of sheep’s wool all around you. 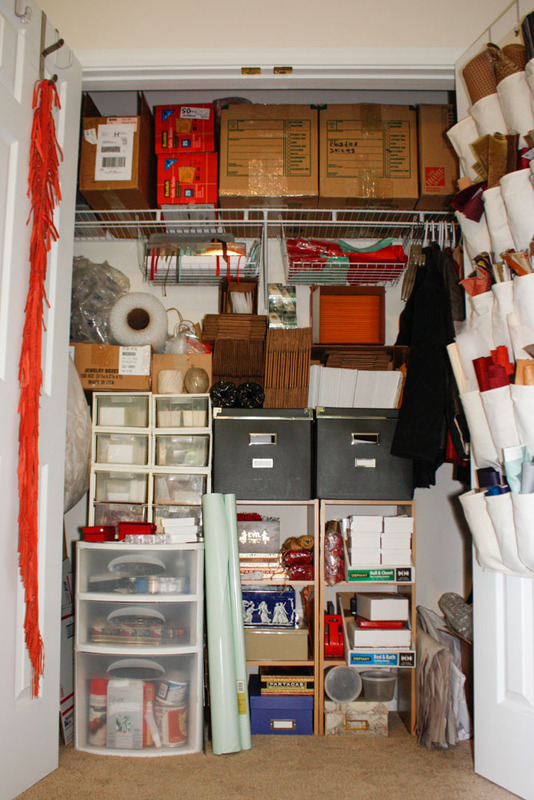 I have my roving in containers organized by color, so it’s easy to find what I need. Besides (a lot of) wool fiber, there’s really not much else needed for needle felting. I have a 2” thick foam pad that sits on my lap while I felt, a variety of needles, plus a portable work light, and that’s about it. * Favorite things about this space: being able to learn something new / think about something else unrelated to my work, while I work. My hands may be felting, but at the same time I can be learning all about the Altiplano in South America and the fascinating flamingos that call it home, or reading / listening to The Electric Michelangelo by Sarah Hall for the 50th time. So there you have it. The spaces where everything is handmade, by me, under one roof! Getting my hands dirty is something I look forward to. Dying my hands blue….well, that was new for me until recently. I took a Shibori dying class this weekend, and as always, learning something new and unrelated to anything else I’m involved with, tends to inspire me in unexpected ways. Not only did I learn about the historical significance of indigo, but also practical information about working with natural dyes. I can admit this now, after the fact, that I didn’t realize indigo was a plant. I guess I always assumed it was a mineral or chemical compound, but it’s actually a crop, one that’s making a major comeback on American farms. Who knew! Well, you might have known, but I certainly didn’t. The class was organized by The Maker’s Collective, taught by Catherine Cross of the Summer Blues Indigo Dying Workshop, and hosted at Knack here in Greenville, SC. Our group spent the first hour watching demonstrations of different techniques, learning an overview of Shibori dying, followed by two hours of our own hands-on experiments. We used clothespins, rubber bands, clamped plywood, and lots of other random stuff to resist the dye in certain areas, creating all sorts of interesting and unpredictable patterns on test fabric, and eventually “real” stuff like clothing. I brought some white leather scraps from my studio, just to see if it would work, and was thrilled with the results. It was such a blast! I need freedom to fail sometimes. I need freedom of process, to experiment with new mediums that may or may not complement the work I do for my handmade business Once Again Sam. My average day is filled with production, making finished items to fulfill orders, all of which have to look a certain way. My business is booming, which is exciting, but I don’t often have time to just dabble and screw around in the studio like I used to. I have to be diligent with my time and make make make, otherwise by business might fail. The thing is, my business won’t fail just because I took a few hours one Saturday afternoon to go learn something cool like Shibori dying rather than working on orders. It’s healthy to get out once in awhile and try something new, just for fun, just to keep my creative juices flowing. Experimenting with different mediums is how my business started, and I have to step back and remember that, and choose to pursue more of it, because it will help me grow. Afterall, I’m a maker (who currently has blue hands), not a factory.